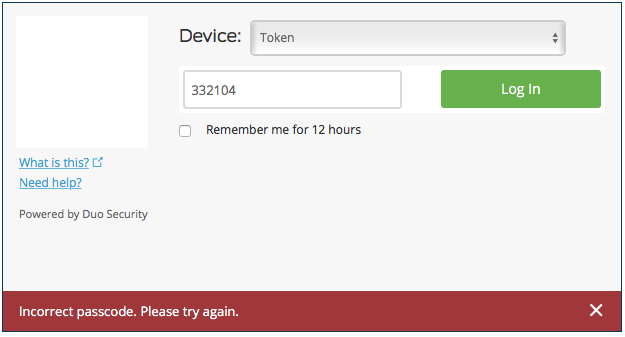 Duo - Incorrect Passcode. Please Try Again. This article will help you resync your FOB should it fall out-of-sync. This happens when you push the button lots of times without actually logging into SIS. If you receive the below message, your FOB may have become out-of-sync. 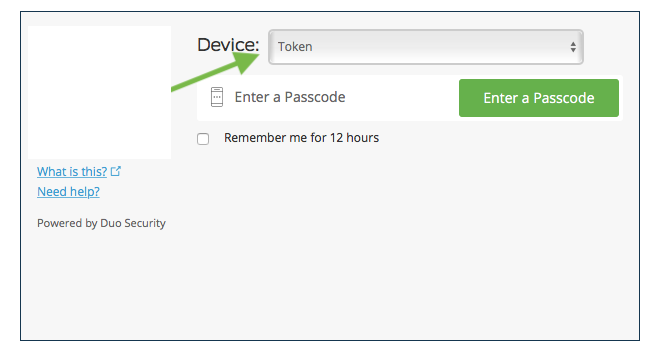 If there is a Device field above of the box you enter your passcode, make sure it says Token. If this field is not listed then Token is your only method to sign in and it is already selected (even though you do not see it). Note: If at any time you click Log in and the passcode does not match what is on the FOB or if you click Log in more then once for a passcode you will have to start the syncing process over. When your Fob has a blank screen, press the green button one time. Enter the number from your FOB in the Passcode box then click Log in. You should receive the "Incorrect passcode. Please try again." message. As soon as your Fob has a blank screen again, press the green button one time. Enter the number from your FOB in the Passcode box then click Log in. You should receive the "Incorrect passcode. Please try again." message. As soon as your Fob has a blank screen again, press the green button one time. Enter the number from your FOB in the Passcode box then click Log in. You should now be logged in.